South winds at the start of the summary period produced a nice push of migrants into the area, but north-easterlies set in after the 13th and activity began to taper off towards the end of the week. New arrivals appeared almost daily including the first chipping sparrows and barn swallows of the spring on April 11th and 13th, along with increasing numbers of golden-crowned kinglets, winter wrens, creepers, and others. Waterfowl remained active throughout the week – eleven species were observed on census on the 11th – including small groups of both teals, gadwall, ruddy duck, and northern shoveler. A total of 500 Bonaparte’s gulls was noted at the Tip on the 12th. A nice variety of 48 species was recorded in the count area on the 14th including spring ‘firsts’ for purple martin, ruby-crowned kinglet, brown thrasher, and purple finch. PIBO’s bird banding program got underway the next morning – 17 birds of seven species were captured, including 10 golden-crowned kinglets. A pair of singing pine warblers in the netting area and an early Baltimore oriole on April 16th were new for 2016. Five sparrow species were noted that day along with increased numbers of ruby-crowned kinglets. Forty-eight species were tallied on the 17th including the first merlin and sharp-shinned hawk of the year. 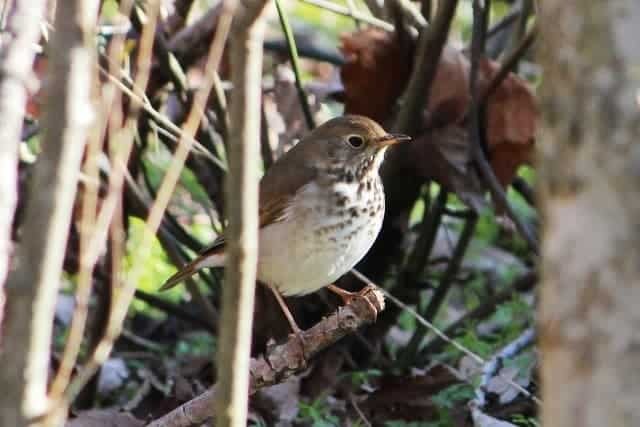 Twenty-three birds were captured the next day – a mix of kinglets, hermit thrushes, winter wrens, and white-throated sparrows, among others. of ruby-crowned kinglets (17 recorded) and hermit thrushes (14), along with six sparrow species. A northern mockingbird was observed at the north end of the island in the afternoon. April 20th was fairly uneventful apart from some large groups of blackbirds – including quite a few rusty’s – small numbers of kinglets and yellow-rumped warblers, and the first blue-gray gnatcatcher of the Spring. PIBO’s next migration summary will be posted on May 2nd.